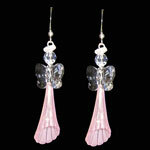 Wonderful easy playful inexpensive earrings made with Lucite. These earrings are designed and copyrighted by The Hole Bead Shoppe. Kits have all the items needed to make 1 pair of earrings including Sterling Silver earwires and 2 inch headpins.